The Indeed.com average salary for a driver at Old Dominion is $59,888 per year. As team drivers were almost always removed from the day to day management that linehaul and P&D deal with so I can't comment on management. I can say that when we have plenty of Freight (80% of the time) we're rolling and earning a good six figure income and home every weekend. If we want to get home early for a family function or personal appointment we're always routed home at our own discretion. I really don't have negatives other than the truck not really set up for a team compared to team drivers at other companies. Great pay, amazing benefits, employee appreciation, home time, and work life balance. The only real cons are there are messed up pre loads, sometimes bad planning, and issues with communication every once in awhile. ODFL for me as a P&D driver in Columbus Ohio is excellent, I came from a small OTR carrier and had horrible pay and home time, equipment was old ragged out international pro stars that had issues every day, and the trailers would always look like they were hand picked out of a wabash trailer salvage yard haha. But then I was hired to OD and I was amazed at how well their equipment was take care of and how nice their tractors were. The pay is too notch and the benefits are excellent, with this company I make more money and have better benefits then my friends that have Bachelors degrees. I fully believe that this company is one of the best and most that any driver would be happy to retire from here, they are about their employees and about promotions from within and have brought their roots with them in their growing process. I’ve had the pleasure of meeting guys who have starting in our dock and became, terminal and safety managers. Dispatchers do a great job at listing to your problems and helping to resolve them and their open door policy is great for if you have a family issue or medical issue going on, You can rely on OD to be their for you. They push the family atmosphere and do well on their promises to you as a employee and their customers. It’s pretty great going somewhere and customers that you work with every day are happy to see a Old Dominion truck. 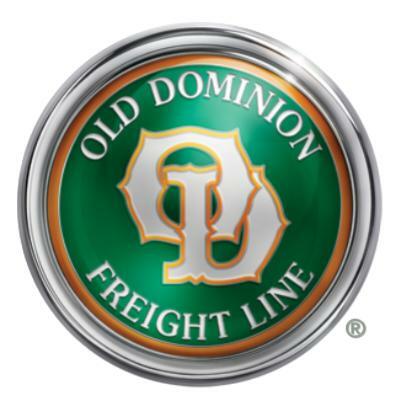 You will feel like a member of the old dominion family and this career will make you love driving again, at least it did for. Hope this review gives you some insight! Im a linehaul driver in socal. Terminal to terminal drop n hook home daily. On a longer run the company will put you up in a hotel for your 10 and send you back right after. Equipment is great and well maintained. Mainly freightliner day cabs with a couple volvos sprinkled in. Almost all trucks are 10spd stick shift. Micromanagement is non existent. Management never hassles you and lets you do your job. Very laid back attitude from the dispatchers to the managers. You get treated very well here. Pay is excellant for linehaul drivers. I only been here for 7 months and average 1900 gross a week. In the summertime all my checks were over 2000 gross. The only bad thing is my schedule. New guys start off on call until i get enough seniority to get a bid with a schedule. Other than being on call i love it here. Major cronyism in upper management at the terminal level. Line haul runs mostly nights and P & D is days. More money in the line haul. Equipment is excellent at the larger terminals and older at the smaller terminals. The smaller terminals get the 3 & 4 year old equipment. I'm starting this one because I've repeated myself several times to different folks asking about driving for Old Dominion. So, I'll shove the info in here, and then I can simply direct anybody who wants the information HERE. Disclaimer - I don't wish to offend anybody. If I mention a company in here, that you work for, don't get upset. DM me and abuse me instead. Just relax. ODFL is an LTL company. LTL is 'less-than-truckload". They pick up shipments, take them to a terminal, and the freight is loaded onto 28 foot trailers and distributed nationwide. For example, a window manufacturer has a trailer full of windows that need to go to say, Lowes, 2 or 3 windows to each store, around the country. So a driver picks up the trailer, takes it to the terminal, and then it is broken down into trailers going to Memphis, Chicago, California etc. Once the 28 foot trailer is full, it is 'closed' and a driver hooks up the trailer with another one and away they go. This is different to 'TL', or "Truckload" carriers where the shipper 'buys' the whole 53 foot trailer and it goes to one (or 2 or 3) destinations. ODFL has many employment positions. Dock workers to work the freight, yard hostlers to move the trailers around, mechanics, despatchers etc. I can't speak much for their jobs, I only know mine. They pay the team drivers 68.53 cents per mile right now. (edit 12/14). That's the top pay. I've known drivers with experience that hired on at the top rate, and others like myself that only had 3 years experience that gradually worked up to the top rate over 2 years. We got a raise every 6 months till we topped out. You are also paid about $1.75 every time you drop and hook a piece of equipment, and when you fuel. So, after a run, 3 hooks and 3 drops and a fuel is about $12. Doesn't sound like much, but it adds up to another $50 a week , on average. We've averaged 5500 - 7000 miles a week there since we started 7 years ago. So, you can do the math. 6000 miles times .6633 is $3,979 plus your $50 drop pay - $4,029.00 . I take out 35% for taxes and 401k, and health insurance and long and short term disability, which leaves $2,619.00 into the bank each week. We pay the highest tax rate, and deposit 10% into the 401k each week. My wife has herself and 2 grown children on her plan, I have just myself on mine. So - expanding the math, if you ran 6,000 miles every week and had one week off, it's very close to $203,000 gross each year. We have averaged between 160k and 185k over the last 7 years. We take a bit of time off, Half weeks here and there, and our holidays - extra time around public holidays. I know teams that run fairly hard, and make up to 220k each year. We run out of Parsons,KS. It's in Southeast Kansas, about 80 miles from where we live in SW Missouri. For about 6 years we were on a schedule from Parsons,KS to Rialto,CA making 2 turns a week, going home for 40-50 hours, then returning. We always left out on a Wednesday night. Now we run 'wild', but most of the time run the 2 turns to California anyway. They always have a lot of freight that runs that lane. I've heard the quote "ODFL will put on a good team out of pretty much anywhere" meaning, if you're a good team, husband and wife or not - they'll put you on out of a terminal that might not be a large one, just to accommodate. They like husband and wife teams, they need them. So, say you lived in Springfield,MO - they'd probably let you work out of that terminal, and just send you to a larger terminal on your first run to get in the system. That's what I've heard, anyway. I know some teams that drove over 200 miles to a terminal to start work, but they'd usually stay out 2 or 3 weeks at a time. The company has grown a lot. I think about 2002 they had about 130 terminals. Now they have over 230. Apart from the 2009 year, after the downturn, they've given pay raises every year, 1 to 2 cents for teams. There's usually a period in Winter when freight slows down a bit, but the last 2 years have been real busy. The larger terminals have fuel, showers, scales, and a break room. This makes life a lot easier for us - a few even have laundry machines (free) so you can run a load of clothes if you get short. One thing I noticed about this company is you don't see them advertising for drivers. I never see an ad in the recruitment books, or in truck publications - well, none I've seen. Most hire on through word of mouth. They dropped their experience requirement a little while ago from 2 years to one. I don't know why. They have a training school, but from what I've read it's only available to family of current ODFL employees, and dock workers wishing to drive. Their requirements beyond that are about the same as anywhere else, I think. No felonies in x years, no failed drug screens in X years, moving violations etc etc. We applied at the Parsons,KS terminal and they sent all our info to head office in North Carolina and once they were happy with us we started. They're on e-logs, the peoplenet system. This now means it's almost a paperless system. All the trucks and trailers have tags on them that are read by the gates as you leave and enter terminals, so there's no pay or trip sheets to fill out. All trips completed by midnight on Thursday are paid the following Friday. The only paper we have to fill out is a post-trip inspection. everything else happens automatically. And I've NEVER had a problem with the payroll. The miles are all practical route - not PC miler or household goods, so you actually get paid real close to what you actually drive. You get sent your load assignment on the peoplenet system, so there's no hook sheets to fill in either. Just hook up, fuel up, get your bills and go. Let me think a bit more and down another coffee before I keep rambling. They supply company uniforms. You don't have to wear them, but if you get them, they expect you to wear them. This said, I've never had anyone comment on what I chose to wear to work. They give you 5 outfits to start with, i.e. 5 jeans, 5 shirts, and a jacket I think. Then there's an annual $100 free order you can put in to update what you have. The selection and quality is very good. Their 401k is good too. If you put in 6%, they'll match half of that, so you put in 6%, they give you 3% free for a total of 9%. We have about a third of ours allocated to company stock, which has done really well in the last 5 years - about a 20% return, as they are growing and expanding and remaining profitable. The rest is broken down into stocks and bonds and the usual. If they have a profitable year, and exceed their expectations, they put a 'discretionary' amount in your 401k at the end of the year. This has happened almost every year - it equates to free retirement money, so I highly recommend the 401k program, even if you just put in the minimum so you can receive the free funds. United healthcare is the insurance. For myself, Health, Dental and vision costs about $13 a week. For my wife with 2 kids (21 and 25) on her plan, it's about $80 a week. The insurance is about as good as any other I guess, It pays about 80% of surgeries, (I've had one), and a $30 copay at the doc and fairly cheap prescriptions, although neither of us take anything regularly. The equipment some might find a bit of a letdown. Let me explain. We came from a company that had us in a brand new Kenworth W900 with all the bells and whistles and a big sleeper, so we were a bit disappointed. However, I can understand why. It's a workhorse, not a show pony. We've had 3 new trucks since we've been there. They're all Volvo or F/Liner Cascadias with a single drive axle, no stereo, no fridge, 48"sleeper, the new ones are condo cabs, the older ones are mid-roofs. 10 speed trans, no bells, no whistles. They'll put in an inverter if you buy one, you can hook your CB up, and bring your own stereo, though a lot of the older ones didn't even have speakers. They spec them very basic. They're there for you to make money with - not impress at the truck shows. The maintenance is great - always have good tires on them, chains supplied, oil, fuel, coolant, washer fluid on tap at the fuel islands or the shop, and there's auto truck wash bays and pressure washers at some terminals if you like to keep your ride shiny. They've been very good to us, especially with hometime and holidays and family emergencies. If you have a problem, and call them, they'll do their best to swap your load out, or get you turned around somehow to go and take care of the situation. I lost my license about 2 months after we first started and it took about 2 months to get it sorted out, they kept the job open for me, and my wife ran a little bit of solo work while I got it sorted. I had attended a CDL school in MO in 2004 that was deemed unfit to issue licenses, so they sent notification for me to re-test, I didn't get it, CDL cancelled. ODFL runs checks on your CDL status periodically and caught it. Luckily before a scalehouse did! That's another good thing. My wife had to stay home a couple of times over the years, once for a month taking care of one of her sons. They let me run solo in the team truck for that time to earn a wage, till she got back. So, they've afforded us a pretty good living over the last 7 years. They're a non-union company, and wish to stay that way. They've always treated us well, and this will probably be the last company we work with in the trucking industry. We've managed to freehold our house on 20 acres with a pool, shop and 2 car garage, buy and freehold 4 rental properties, and our '08 Silverado. Everything else is paid for too - if anything they need to be careful not to pay the drivers too much!! We may not need to work too much longer. My wife wants the house remodeled in a serious way, and I'd like to trade that '75 Vette for a '08 Vette, so I guess that'll give us a reason to go to work for 2014, and 2015. I know there's a lot of companies to drive for out there. You might be driving for one that you're pretty happy with, and I know everybody has different reasons for driving for different companies in different situations - but if any of the above sounds good to you, then I highly recommend you check them out. Again, I stress - this is just our experience working out of one terminal - there's 200+ terminals and I think over 250 teams, but everybody I run into seems to be pretty happy with their lot. Feel free to comment or send me a message if you have other questions. I'm not a recruiter, there is a recruitment bonus of $300 per driver but I don't really care - if I can help just one team get a better lifestyle from trucking, then writing this was worth it. Good luck, Be safe, Blair. We now have 2015 tractors and a no smoking policy in place for these tractors going forward. Makes sense for solo slip seats, but kinda stupid for team tractors. Also - 2015 going forward, inverters are purchased off the company and installed. Way too busy. Not enough drivers. Tons of freight.Anybody want a job?? Parsons, KS and Amarillo, TX terminals were looking for team drivers last I heard. A north east team that is hiring on reported that the application is taking a long time at corporate - 2 weeks so far. I don't know if this is typical or not or if they're just swamped right now. All the final hiring decisions go through corporate, which is a little disheartening because you'll most likely never meet them, but they get to judge you on paper and have the final say. Also worth mentioning - the Amarillo team said that there was a hiccup with their application because they had not listed a deer strike. They had however discussed it with the terminal manager , who backed them up. Their application was successful. So - Probably best to be honest and list EVERYTHING - preventable, non-preventable, animal strikes, tickets, warnings - the whole lot. Seems we're shifting to an on-line pay system. The old way was a paper check or deposit confirmation that had all your details year to date of pay types, taxes, deductions, the whole 9 yards. This was accompanied by a white sheet of paper that has the miles and pay, pay rate and extra pay for the WEEK listed on it. Will post more details as I learn . I think Parsons, KS will be one of the later terminals to convert. Freight levels continue to be elevated, Typically this is a time for a a slow down, however we haven't seen a dip in fright levels. A little down time on the yard in California, 2-5 hours, but nothing to get too bent out of shape over. Changes to the health insurance. The premiums have increased slightly, not much to make a real difference. The BIG change that has a few upset is that spouses are no longer eligible for coverage if their employer offers coverage. So, for some drivers, that have a wife or husband that works somewhere that has crappy insurance, they now have to either take it, or quit. Freight levels continue to be elevated. We finally saw 15 hours in the motel last week, in Rialto. Previous years it has slowed mid October, not so this year. Company 3rd quarter financial results show 15-20% increase YTD and year over year. Share price $76 - ($17 in 2007, glad we have 30% of our 401k in ODFL stock). No changes in policy. Drivers organised for home time on Thanksgiving. They've always been pretty good at getting drivers home on holidays. Freight fell off a cliff last week, so a few wild teams were told for the first time all year to hang out at the house for another day. This being said, it's still a lot busier than previous years. I heard through the grapevine that breakdown pay would be increased to $7.50/hr, for years this was stuck at a pre-historic rate of $3 something - barely enough to warrant entering it with your pay clerk. We're heading out to be back a couple of days before Christmas - again, they're pretty good at getting you home for the day, unless you wind up cutting yourself too close for comfort and getting caught by the weather. Looks like we'll scrape by another $160,000 gross year, maybe break $165-$170. We haaven't worked that hard this year. I'll post final details somewhere this year. We were off from Dec 23rd till January 2nd, they didn't ring us, we didn't ring them. Did one trip to CA then had check engine lights on the way back, Cummins had the truck for 3 days, and when done with it - OD had no freight. So we came out yesterday, but will have to return after ths run to hit a couple of doctor and dentist appointments. Freight has been slow, typical around the Christmas/New Year time. Final paystub put us at $85,000 gross each. Another team driver I know that works harder than us (obviously), hit $100k. On the plus side - we missed out on all the fun on I40 during the days off - evidenced by the amount of tire tracks in the ditch and torn up guard rails! February 2015 The final update. We have our 2 week notice written, and ready to hand in when we go to work tonight. After our last day on the 13th (yes, Friday the 13th), I can come back here and tell you the REAL story, without fear of retribution !!! Just kidding, there's little more to tell. We've been running one run each week since New Years, there's been an acceptable drop in freight, seasonal, as I said - so a bit of motel time. Out for this run, and then a couple in the next 2 weeks. The End. I'm now leased on to Landstar with my own truck, pulling flatbed. I've been with OD for about four months now and can say that I'm truly thankful to have such a fantastic employer. I'm a linehaul driver. I won't hit top pay rate for another year or so, but I'm already clearing after taxes around $1000.00 a week - that's after all deductions too, like 401k and benefits. I'm at close to .58 cpm and average 2500 miles a week. I'm home every night with two days off a week. Paid vacation jumps from 1 week to 2 weeks after just one year of employment. Besides the excellent company matching for 401k (company management and growth has been tremendous), we get 6+ paid holidays a year (including birthday), employee benefits are free (if just for the driver), equipment is maintained every three months, tractors include Freightliner Cascadias and Volvos, and plenty of terminals are currently being remodeled - yet another example of company growth. During the recession that hit a few years back, ODFL didn't cut wages and has continued to provide company 401k matching. In short, OD is a strong company that is experiencing consistent, healthy growth. You can see evidence for this with the company stock. There are other perks that I just can't think of right now. I work out of one of the larger company terminals. And no, I'm not a recruiter. :biggrin_25520: I'm just a driver that is thankful for being part of such a great company. OD is the type of company you can join and stay with.